With the right visa you won’t need to go on visas runs every 15 days to stay in Thailand. 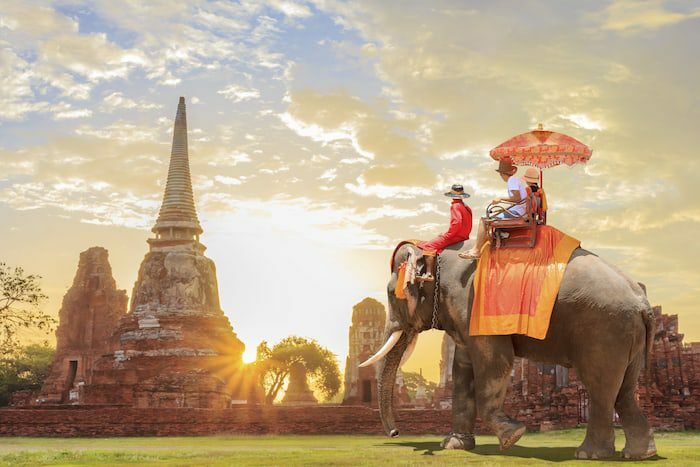 It’s a well-known fact that Thailand is one of the most popular places for nomads. While it’s not my particular cup of tea, I can understand the draw. First, there is the hustle and bustle of Bangkok — one of the biggest cities in Southeast Asia and all of Asia in general. Then, for those who want a slower pace, there are the smaller cities like Chiang Mai which has become a haven for expats. You also have cities like Chiang Rai that boasts hundreds of Buddhist temples as well as historical and cultural sites alongside the jungle. For those who prefer the island life, you’ve got Koh Samui and Thailand’s other islands. And you can’t forget the beach city of Hua Hin where I’m buying a condo. To put it simply, there’s a place for almost any “paradise” preference in Thailand. I’ve never had a great opinion of Thailand. However, I am buying a property there now because I’m willing to take a chance (with some convincing from Reid, who we interviewed for this article). I’m looking to add to my beach portfolio anyway; and Thailand’s such a popular place that I don’t have to be hot on the location as a place to live to profit from investments made there. I’m still tepid on it and have my concerns, but it’s popular and people are interested, so I’m willing to take the chance. But how do you get in to the country? Passport holders from the UK, Malaysia, the United States, Canada, Italy, Germany, Japan, Australia, and France are the only tourists allowed into Thailand without a visa. Under Thai law, such tourists can be in the country up to 30 days without needing a visa. Tourists who wish to stay in the country longer without obtaining a visa have often resorted to visa runs in which they cross the border to a country like Malaysia for a couple days and return for another 30 days of visa-free visitation. In light of such practices, the Thai government has begun to crack down in recent years and has limited the visa-free period upon re-entry by land to 15 days instead of the previous 30. Compared to other countries that allow easy visa-free travel and visa runs, Thailand’s crackdown is rather strict. They’re not giving tourists a lot of leeway and are basically ending the process of visa runs altogether. It has become much harder to become a nomad there. Another issue applies to the rising number of people I have been helping to renounce US citizenship, especially in light of the new Trump tax reform. While you will free yourself from many tax and filing obligations by renouncing your US citizenship, one new reality you will have to deal with is that popular tourist destinations like Thailand are more strict about who receives visa-free access to their country. If you renounce US citizenship and do not have a Malaysian, Cambodian, Canadian, German, Italian, UK, Japanese, Australian or French second passport to fall back on, you will need to get one of the visas listed below in order to enter Thailand. Most of these passports are difficult to obtain and come with their own high tax rates. 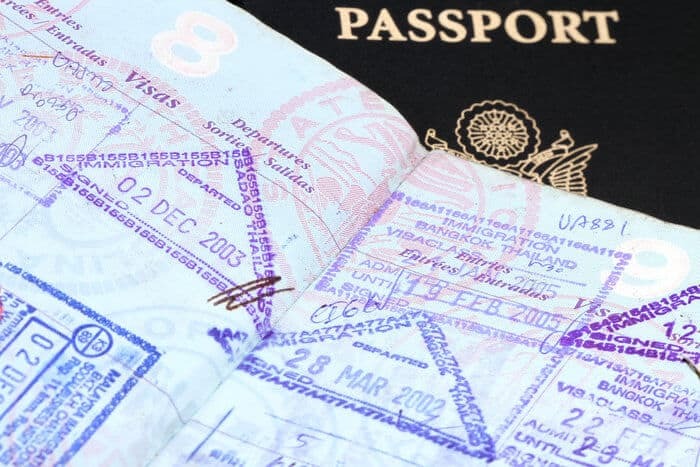 You could always invest in Cambodia and get a passport there relatively easily, but other than that you’ll have a hard time finding an attractive second passport that will get you into Thailand visa-free. So what can a Thailand-loving expat do to get a few more days in the country? In my opinion, you should go where you’re wanted and say goodbye to Thailand. I lived in Malaysia. It’s still one of the friendliest places in the world for tourists and, in my opinion, Kuala Lumpur is a step above Thailand’s cities. I know it doesn’t have all the things people are looking for, but it covers a lot of the bases. However, if you don’t want to give Malaysia a try or just prefer Thailand, there are several visas you could potentially qualify for in order to stay longer term in the “Land of Smiles.” I know a lot of you are still interested in Thailand — despite my tepid feelings — and I’m going to be spending a week or two there in the near future, so I figured it was about time to discuss your visa options in the country. As mentioned, if you enter Thailand without a visa (i.e. on a visa-exempt entry), you have a full 30 days in the country. That rule has not changed. What has changed is the re-entry policy. Up until a year ago people just went on visa runs every month. However, back in 2014 the Thai government decided to both intensify and enforce their immigration laws, bringing into effect the 15 day rule for border crossings. If you don’t feel like crossing the border every 15 days, then the next best solution is to obtain a tourist visa. At the most you can get a 60 day tourist stamp. However, foreigners are allowed to spend up to 90 days in six months in Thailand. To get those full 90 days, what most people do is enter on a 30 day visa exempt stamp and then extend that to a full three months with a 60 day tourist visa. This works perfectly fine. Just note that after three months you will have to leave for another three months before you can return to Thailand. If you apply for a visa before entering the country you have two options: the non-immigrant visa (a single entry visa valid for 90 days) and the one year non-immigrant visa (a multiple entry visa valid for a year, but still limited to 90 days per entry). In summary, if you’re planning on staying less than 30 days (and you are from one of the few visa exempt countries) then just enter on a visa stamp. If you’re planning to stay somewhere between 60-90 days then it’s more convenient to apply for an actual tourist visa from an embassy than jump over political borders every two weeks. So why the crack down? In some ways, the Thai government wants to stem the flow of tourists to its country. Thailand is one of the most touristed countries on the globe. In fact, Bangkok was the most touristed city in the world this year — beating out even London and Paris — with almost 22 million visitors as of November 2016. It’s easy to assume the Thai government doesn’t want so many people in the country to the point that everyone walking around the central business district is a foreigner — which is what it can be like, especially during tourist season. From Reid’s perspective, however, the crack down is also a reflection of the Thai government’s desire to go for more quality tourists. They’re not too keen on the under 50 crowd that wants to retire early and party all the time. As such, getting any type of long term visa in the country will require that you prove links to the country — whether that’s through marriage, education, business or investment. If you are willing to go to work for a company, foreign government or other organization based in Thailand, you could qualify for a Thai work visa and permit. In order to get the work permit, your employer must file an application on your behalf. Once you receive the visa and permit, you can live and work in Thailand during a one year period. Many expats in Thailand go the educational route to obtain a longer-term visa. Of course, you could enroll in Thai classes, but if you’re a serious Nomad Capitalist this won’t cut it for you. If you’re going to enroll in a Thai class as some kind of trick, ask yourself if that is really the best use of your time. If you make $1 million a year, your time is worth $500 an hour. And, even if you spend just 40 hours a year enrolling in and going to these Thai classes, then you just wasted $20,000. Even if all you do is spend less than an hour a week going to these classes, you’ve just wasted that much money. It’s especially a waste if you don’t really care about learning Thai. How much money are you going to waste spending your time sitting in a Thai class? If you don’t want to be a student, then don’t be a student. Reid, on the other hand, went to a real college and got a real degree and speaks fluent Thai. He was able to attend a four-year institution where classes were in English and he was able to obtain a high-quality degree. He attended a top-ranked university that many world rankings place in the top 200 college institutions in the world — on par with colleges such as the University of Florida. So it wasn’t just some backwater diplomaville that he graduated from. It is an actual respected university in the region. Moreover, if he wanted to, he could easily do something with his degree. If anyone googled the place he went to they would easily come to the conclusion that it is a respectable institution. But the reason why Reid chose to study in Thailand was not for the degree at all (or the visa), but to learn how business and culture operate in that part of the world. It was more for what he’d get outside of the university more than inside. And that’s really what any foreigner coming to Thailand and coming to university will get the most out of — not the university in and of itself, but the region and the culture. It’s something Reid would recommend to anyone interested. But how does the visa work in this situation? Anyone who chooses to enroll at a full time university can get a student visa with the opportunity for yearly extensions. If you enroll in a Thai language course or some type of institution that is not really a university, you’ll usually get a visa good for three months with three month extensions available after that based on renewal. Since Reid has graduated from university and is not in the over 50 crowd, he could really only choose one of three choices. He could either 1) marry a Thai girl, 2) form some sort of business or work for some sort of company (see work visa and business visa) or 3) obtain an investment visa. He chose to go for the investment visa. Not many people go about things that way and there isn’t a lot of information out there about it, but there is such a thing as an investment visa. To qualify you must invest at least 10 million Thai baht (which is currently about USD $280,000) in stocks, real estate, bonds, and really any type of investment available in Thailand. Once the investment is made you can then renew the visa on a yearly basis for an indefinite period of time. The investment visa is not a permanent residency, but it does allow the investor to stay in Thailand indefinitely more or less. Of course, laws do change, but Thailand is known to grandfather people in to law changes. For example, back in the 1990s the 10 million baht investment visa could be bought for 3 million baht. Even though that’s not the case anymore, there are still people living in Thailand who obtained their investment visa with the 3 million baht 20-30 years ago. And their investment requirement did not go up over time. So, though Reid is not technically a permanent resident, the investment visa allows him to live in Thailand indefinitely. And, even if the laws change, he will likely be able to remain in Thailand based on the government’s history. The Thai marriage visa is technically known as the one year extension of stay based on marriage. Just from it’s technical name we learn that it is extended on a one year basis. With a marriage visa there is no need to exit the country during the year’s time and it can be renewed within the country. The visa also gives the holder the permission to work within the country. Besides being married to a Thai national, you must also meet certain financial criteria. You must either have a security deposit of 400,000 baht in a Thai bank account fro at least two months prior to your application OR a monthly income of at least 40,000 baht with a letter from your embassy verifying the income. You could also qualify with a combination of both a deposit and income, as long as the total is at least 400,000 baht (just under USD$11,300). You will also need the proper paperwork, including your passport, police clearance and a medical certificate. Once you receive your marriage visa you will still need to follow the general 90 day reporting rule (discussed below). Before delving in to the details of the Thai business visa, it’s important to note that the business laws for foreigners in Thailand are very, very difficult. (The one exception is the Treaty of Amity that benefits US citizens, which you can read about here). While it really is another topic in and of itself, suffice it to say that it wasn’t a very viable option for Reid because most foreigners cannot own more than 50% of a company. Reid was not about to invest in something that he wouldn’t actually own. Having said that, if you are interested in obtaining a business visa in Thailand, you will need to apply for the non-immigrant B visa. It’s best to apply for this particular visa before going to Thailand. You can read more about the requirements and paperwork needed to obtain a business visa here. 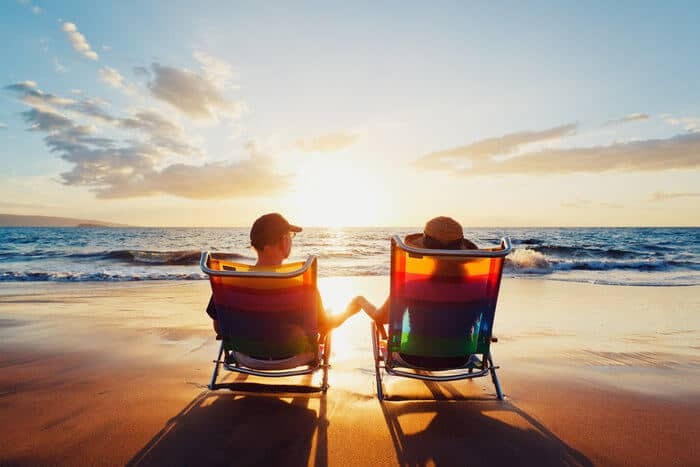 If you’re over the age of 50, you can get a retirement visa fairly easily. The main requirement is proof of pension, but it is not really all that strict. You will either need to show proof of a security deposit of 800,000 baht (roughly USD$22,500) or a monthly pension or income source of at least 65,000 baht (about USD $1,800). Again, you can also have a combination of both as long as the total is equivalent to or higher than 800,000 baht. To begin the process you will first need to obtain a non-immigrant visa which you will then convert into a retirement visa that will be good for one year and available for renewal within Thailand on an annual basis. With the constant need to renew any type of visa, some wonder if there is a path toward permanent residence in Thailand. The answer is yes, but it’s limited to only certain visa holders — mainly marriage visas and work visas. If you work for a Thai company for at least three years and can provide personal tax statements proving an income of at least 80,000 baht per month, you could qualify for permanent residence. If you’ve been married to a Thai national for at least five years and have a minimum monthly income of 30,000 baht during that five year period, you could also qualify. Overall, the process is a little more complicated than it seems at first. It’s the reason why Reid doesn’t have permanent residence in Thailand, even though he was a student for four years. So, if your end goal is to get permanent residency, recognize that you will have to get a certain type of visa in order to qualify. It won’t matter how long you’ve lived in Thailand with one visa or another if you don’t have the right visa to grant you a pathway to permanent residence. For people who have some money to throw around (but much less than is needed for the investor visa), you could get the Thai Elite Visa that will allow you to live in Thailand for up to twenty years. 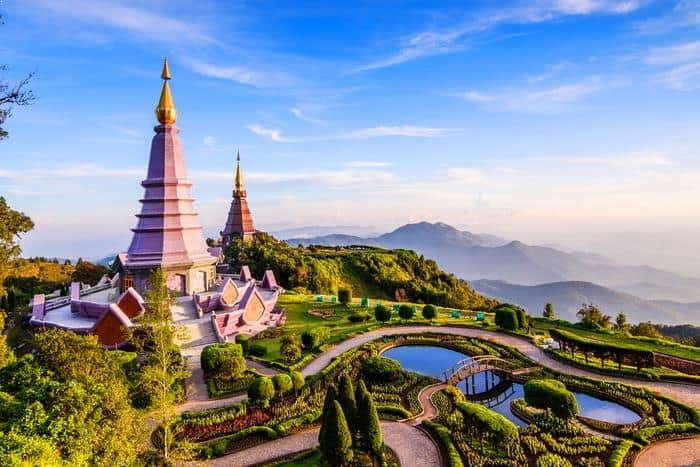 It’s not a permanent residence card, but it allows you to stay much longer than the majority of the visas listed here and allows you to live in Thailand year-round. The Elite Visa also comes with some extra benefits and special treatment that required an entire article dedicated to explaining the program. You can read more about it here. Now that we’ve covered all the types of visas you can get, there are just a few questions left. First of all, what happens if you overstay your visa? According to the US embassy, Thai police have been known to sweep areas popular with low-budget travelers and arrest anyone who has overstayed their visa. We checked in with Reid to see how common of an event this is. He’d never heard of a single incident. Police raids may happen, but they’re not common enough for an expat who’s lived in the country for several years now to know about them. However, that doesn’t mean it’s a good idea to overstay your visa. For one, it’s rather difficult to leave the country on an expired visa and not get caught. If someone has overstayed their 90 days, they will be stopped by immigration on the way out. The penalties range from a small fine to a ten year ban from entering Thailand. If you’ve overstayed less than 90 days, then you just get a fine. On the other hand, if you’ve overstayed five years of more you could be banned from the country long term. Reid did confirm one thing mentioned on the US Embassy’s website: If you do overstay your visa by more than 200 days, you may be required to spend time in the immigration detention center before being deported. This is usually for just a night though and being deported really isn’t that common. For the most part, they fine you and they put you on the next plane out. And they may or may not ban you from entering Thailand from anywhere to a year to ten years. The rule to go by is to simply avoid overstaying a visa. Key to avoiding problems such as overstaying a visa is checking in every 90 days and renewing your visa on time. Most visas — whether for marriage, investment, education, retirement, etc. — require a 90 day check-in regardless of the length for which the visa is extended. Every consecutive 90 days you spend in Thailand you have to go up to the government complex and check in. (The complex is a big building full of all sorts of government offices in the north part of Bangkok.) However, the 90 day check-in is only for every 90 consecutive days. That means that if you leave Thailand after being there for 45 days and go to Cambodia for a day or two — as Reid does quite a lot of to run his fund in there — then once you come back the 90 days restart. In other words, if you’re a frequent traveler and you often leave the country to visit Cambodia or Vietnam or Malaysia, etc., you could be like Ried who hasn’t done the 90 day check in in two years. Other than that, the extension itself is done every year and, while it’s not that pleasant, it could be worse. It usually takes two to three hours and definitely adds up to a wasted day. But that’s reasonable considering the 15 day visa runs you would be doing otherwise. Unless you’re over the age of 50, want to start a business in Thailand, are married to a Thai or just really want to live in the country and have the money to back it up, the best way to go about Thai visas is to spend six months out of the year in Thailand and then travel around to the many other countries in Southeast Asia that are very easy to live in. You could very easily spend six months out of the year in Thailand, six months in Cambodia or Malaysia or really any country in the region. For retirees, if you’re over the age of 50 it’s easy. If you’re under the age of 50, it’s very difficult to spend more than six months out of the year in Thailand. That’s what it boils down to. The Thai Elite Visa for Nomads: Is It Worth It? You forgot to mention the ‘Elite Visa’ which you can basically purchase for a big lump sum. Good article overall however. You’re right, it is getting more difficult and also more hostile for foreigners to stay in Thailand.